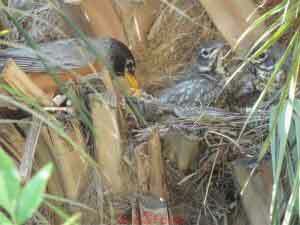 In the early Spring (actually late January or early February here on the West Coast) the first robins start to show up. 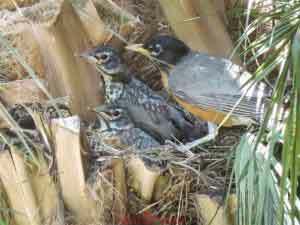 Later in the summer they build nests and then build new robins. 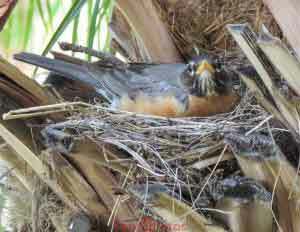 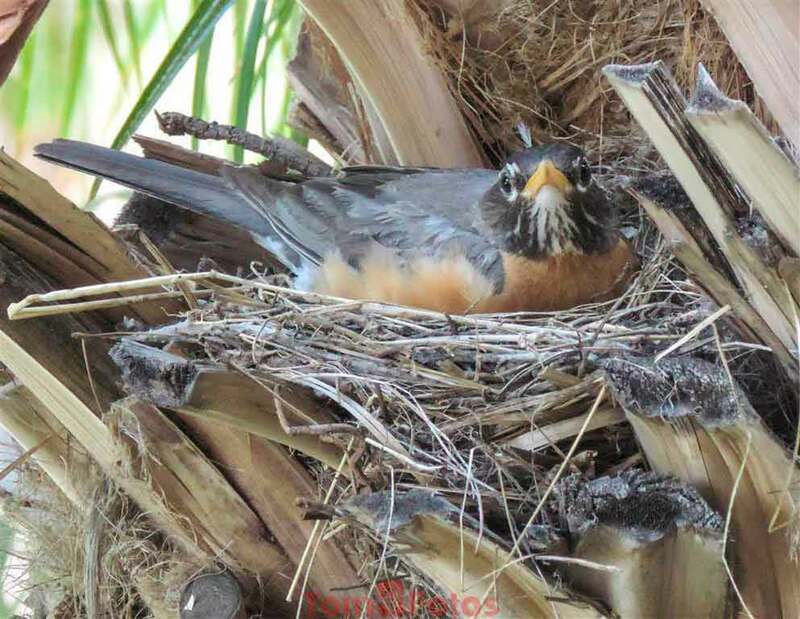 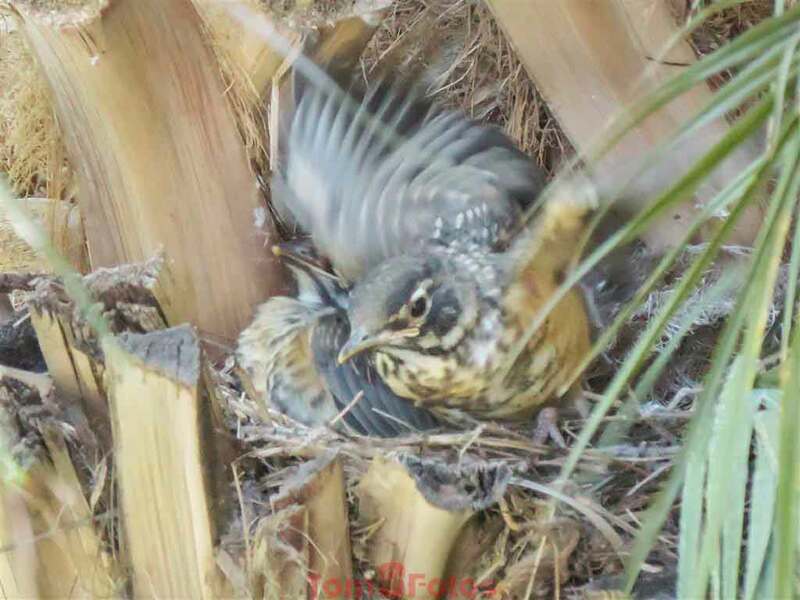 One couple built a nest in a local palm tree right about eye level. 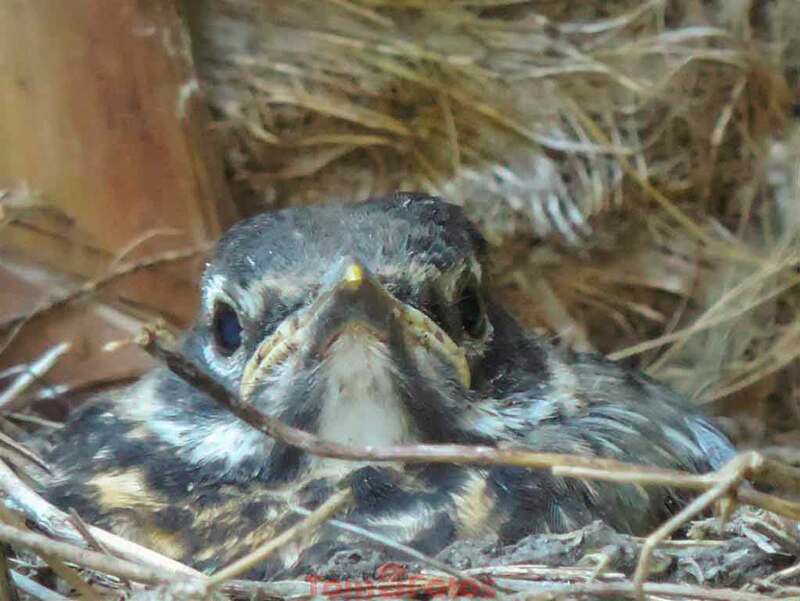 By hiding around a building corner or other vegetation I was able to take a series of photos from eggs to fledged birds over a roughly month-long period (two weeks to hatch and two weeks to grow and leave the nest). 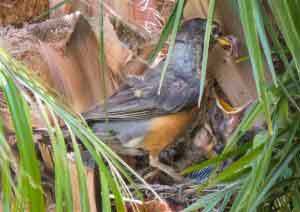 Competition was stiff and one of the baby birds, while growing, did not get enough and perished. The adult found the dead baby and, after confirming it was dead, dragged it to the edge of the nest and dropped it over the side. 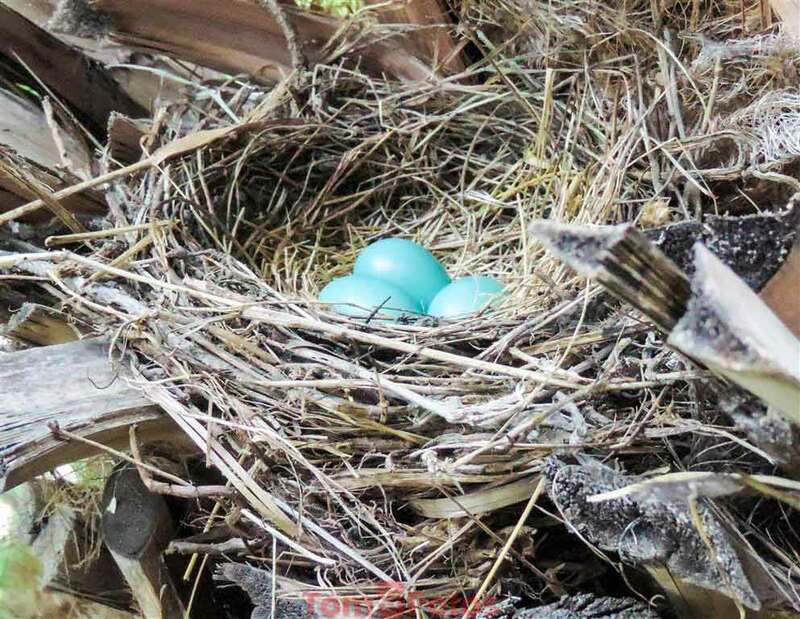 This kept the nest clean. Even the babies cooperated in that by rearing up and squirting their poop up and out of the nest instead of just using the nest itself as a bathroom. 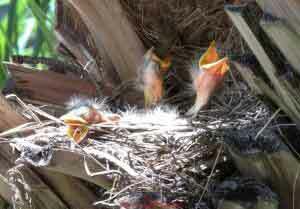 After some time though, the babies started to look outside the nest at the world beyond. 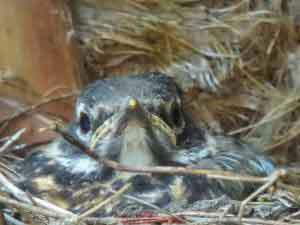 At the two week point the remaining two babies started to learn how to fly as mama points them to the great outdoors. 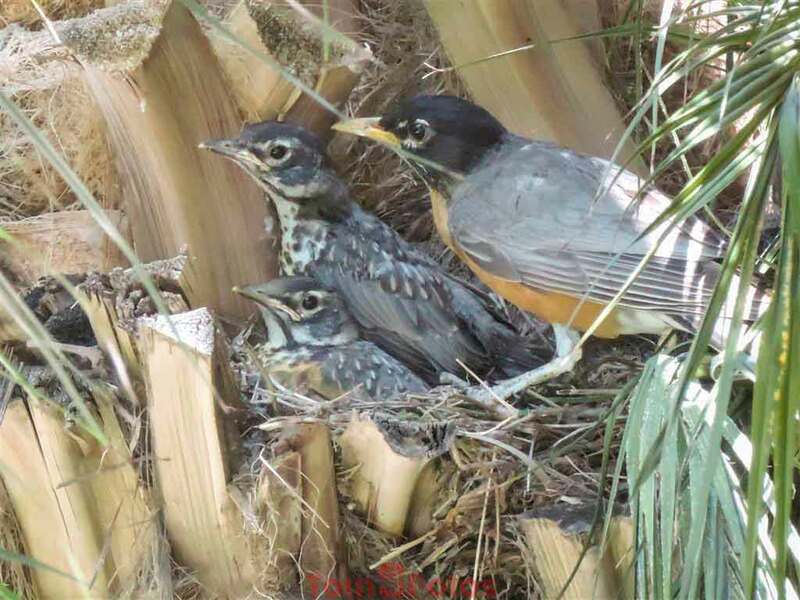 Finally, one tries and then the other. Their training was not done as the first flight basically took them to the ground where the parents taught them to hunt for worms and such so they could feed themselves. 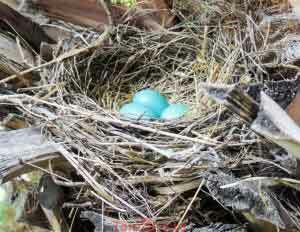 None ever came back to the nest. 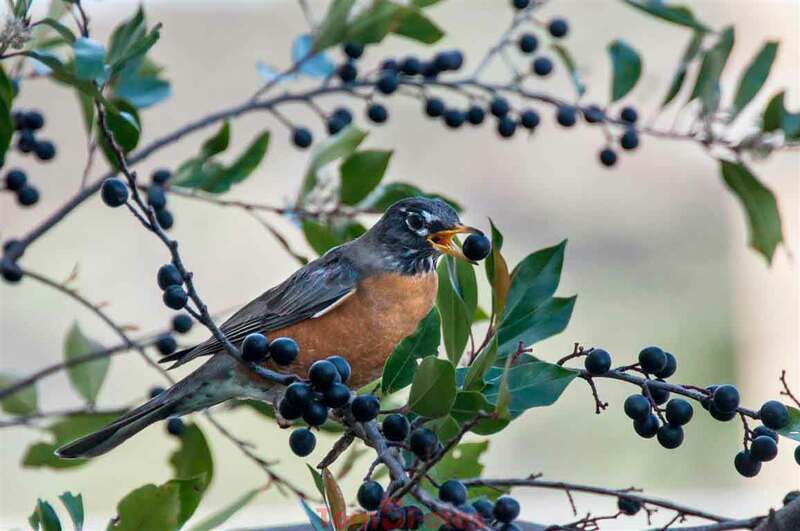 Bird eating berry: Taken 3 March 2014 using a Nikon D90 with AF-S Nikkor 28-300 zoom set at 300mm using ISO-400 shooting f5.6 at 1/500sec. 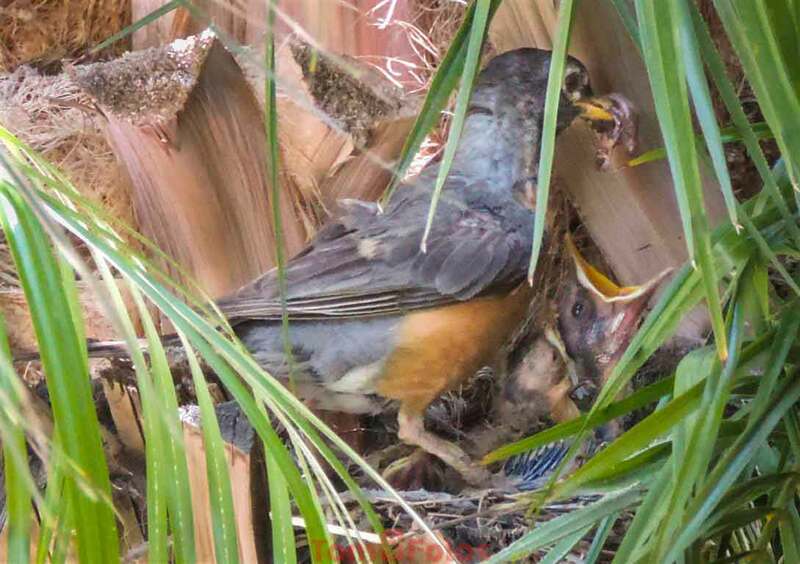 Robin nest sequence: Taken late July and early August 2013 using a Nikon Coolpix P520 usually at about ISO-1400 with the zoom set about 60mm (300mm full frame equivalent) using f4.8 at 1/100sec.